Trends are short-lived. The times when you could enter the market in the morning and exit the market in the afternoon are over. These days the markets can turn around on a dime. Low trading commissions and computerized trading have destroyed the nice and long intraday trends. However, with “The Simple Strategy” you can take advantage of the small intraday trends that we are seeing in today’s markets since we are only trying to capture 15% of the average daily range. More about this later. As you will see, you only need a charting software with “basic” charting capabilities: Your charting software needs to be able to plot RANGE BARS, BOLLINGER BANDS, MACD and RSI. More than 90% of the charting software packages that are available today have these capabilities. There’s no need to buy any proprietary indicators or expensive charting software! 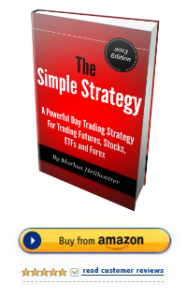 In short: “The Simple Strategy” can greatly simplify your trading. Using this strategy has helped ME tremendously in my own trading. Before I traded “The Simple Strategy”, I was an indicator junkie. I plotted so many indicators on my chart that I could barely see the price action any more. And all these indicators didn’t help! It’s a common disease amongst traders - you analyze so many things that you become more confused. It happened to me! When I looked at all the indicators on my screen, half of the indicators were indicating BUY and the other half was yelling SELL. “The Simple Strategy” uses only three indicators and that’s all I need to make my trading decisions. In short: I will explain everything you need to trade this strategy!